Police spokesperson Brigadier Vishnu Naidoo has issued a statement regarding two Mozambican’s arrested in the Kruger National Park in October 2014. The pair was discovered by field rangers in the Lower Sabi section of the Kruger National Park. They were armed with a hunting rifle and an axe and were apprehended on the scene and taken into custody, where they were charged with possession of an unlicensed firearm, unlawful possession of ammunition as well as trespassing. Sentencing was handed down in the White River Magistrates Court on Monday 31 August 2015. Each poacher was sentenced to eleven years for possessing an unlicensed firearm, unlawful possession of ammunition, as well as trespassing. Protecting the country’s wildlife is a priority crime for the South African Police Service and this conviction is indicative of how our members work tirelessly to ensure that criminals pay for their crimes. This conviction will serve as a deterrent to other would-be poachers. In a statement released by Environmental Affairs Minister Edna Molewa, there have been 749 rhino poached this year, of which 544 were in the Kruger Park. While this is indeed good news, clearly something drastic has to be done about the never ending slaughter. In a drastic move, the iSimangaliso Wetland Park Authority and Ezemvelo KZN Wildlife have started a rhino de-horning programme on the Western Shores section of the park. The Park…..has experienced an unprecedented surge in rhino poaching over the last 24 months – often with simultaneous multiple poaching incidents. As a considered response, and after in-depth discussion, reflection and specialist consultation, the iSimangaliso Authority, together with our conservation partners EKZNW, is instigating additional strategies and interventions to bolster rhino security in sections of the park where they are most under threat and vulnerable to rhino poachers. This week saw the conclusion of the de-horning of black and white rhino on iSimangaliso’s western shores. The task was undertaken by Dr Dave Cooper of EKZN, and was assisted by Dr Mike Kock and his team from the Onderstepoort Faculty of Veterinary Science at University of Pretoria. 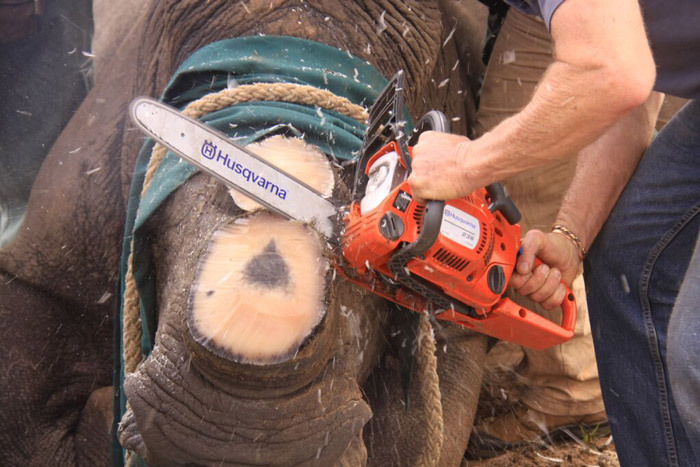 Each procedure takes about 20min, and renders the rhino useless to poachers. …the support of conservation-minded local communities has led to significant victories in the struggle against rhino poaching around the park. iSimangaliso and EKZNW will continue to consider all developing strategies that work towards the stopping of this onslaught against defenceless animals and South Africa’s natural heritage. Removing the Western Shores rhinos’ horns has now given them a better chance of survival.